Golightly Media is pleased to announce that the Hope North Inaugural Gala Event presented by Cause Effect Agency on September 18th at City Winery was a success with many celebrities in attendance for an amazing organization and a wonderful cause. 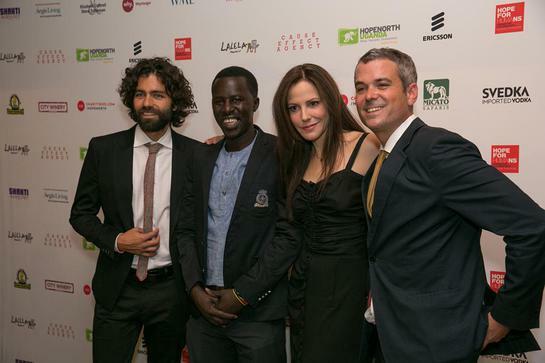 Stars such as Adrian Grenier, Alec Baldwin, Parker Posey, Jemima Kirke, Hunter Parrish and more gathered together to honor the contributions of actress and advocate Mary-Louise Parker as well as recognize the education initiative that founder Okello Sam has started that gives hope to victims affected by the civil war in Uganda. In an effort to raise much needed funds for Hope North, in addition to the live event, an on-line auction is currently running by Charity Buzz ending October 3rd. Supporters can place bids for incredible donated experiential items like a private performance in your home by ELEW, lunch with Mary-Louise Parker and Susan Sarandon, golfing with Richard Kind, a meet and greet with Whoopi Goldberg and VIP tickets to The View, a workout lesson with Mary-Louise Parker and Parker Posey at Physique 57 in New York, and so much more! Founded in 1998 by artist and former child soldier Okello Sam, Hope North is an accredited secondary school located on a 40-acre campus with an international arts center, vocational training, and a working farm, staffed by 26 dedicated Ugandan educators. Over 1,500 vulnerable youth have lived at Hope North, and today 255 incredible youth are working towards their degrees and planning careers. These youth in turn are contributing to peace-building by organizing educational theater and soccer tournaments throughout the north, an area destroyed by years of war, reaching thousands more. Hope North is educating and healing the young victims of Uganda’s civil war, including orphans and former child soldiers, empowering them to become voices for peace and development.